Canoes and kayaks are not as stable as most other craft on the water. You need to be prepared to enter the water, even if you don't plan to, and it is essential that you understand the risks and how to self-rescue. The greatest capsizing risks to paddlers are swells and swamping. Always check the weather and tides before you head out. And stay away from big boats and shipping channels. Having the skills to stay upright is critical. If you don't know what a support or bracing stroke is, you need to learn! 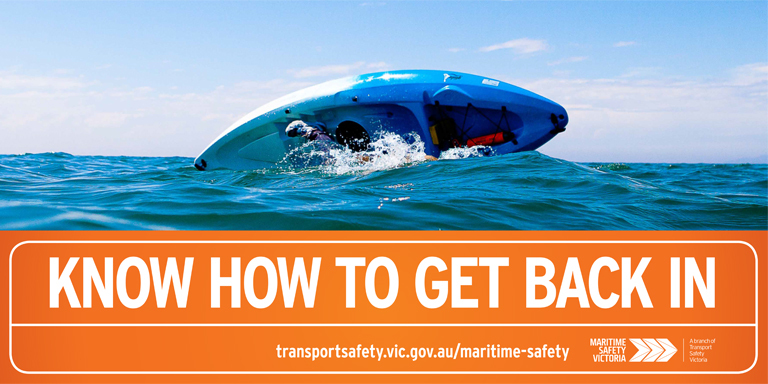 Ask your local kayaking or canoe club about safety courses. A suitable level of fitness is also important. Carrying a bilge pump (or bailer) and wearing a lifejacket are mandatory for all paddlers, but we also highly recommend carrying a paddle leash, a paddle float and a means of raising the alarm. Expect to get wet and dress accordingly. Choose materials that stay warm when wet and dry quickly. Avoid cotton. If you end up in the water, the most most important thing is to stay with your craft. Not only is it much easier for rescuers to find you, but it enables you to reach for your safety equipment and effect a self-rescue. A paddle leash can also prevent you losing your paddle if you capsize. And used with a paddle float, your paddle can make getting back in a lot easier. Teaching yourself how to get back in your kayak or canoe if you capsize can make all the difference. Self rescue is extremely physically demanding and fatigue will set in quicker than you think. Cold shock is also a serious risk in Victoria for much of the year. The videos below show a range of techniques to learn for your particular craft. As third party content, we take no responsibility for their accuracy, completeness, reliability or suitability and our advice would always be to attend a professional training course. The Canoeing Australia website has a list of national training providers.